A baby church has just been born in Mibu. Though we’re not up nights, we feel the excitement and concerns of a new parent. Though we have been praying for this, anticipating this, hardly daring to hope for such a thorough reception of the Gospel, it is really happening. At our very first meeting with the new believers in Mibu, we taught on several basic things – including the ability we have to talk to God. (aka prayer 🙂 The main hurdle that the culture here must overcome is the thought that prayer is manipulation. They have been trying to manipulate any spirit they have ever heard of (or dreamed up) for centuries! A few days after the lesson, I was walking along a trail with Tima. I suggested that we talk to God together, and he was glad to – but thought we’d need to stop hiking and find a good spot and sit with our eyes closed. (Town and churchy influence travels even this far into the back of the bush!) I about knocked him off his feet when I told him that we could go ahead and talk to God as we walked along! What a freeing concept this is…. no formula to follow, it can’t be done incorrectly, no punishment for leaving something out. What a tool it has been for “on the job” teaching about God’s great love and desire to have a real and personal relationship with His children. Now, just as so many of you have been praying for the salvation of the people in these two villages, Mibu and Beng, we are asking these new believers to pray in earnest for the Bible teaching in the first outreach village – the Mibu speaking village of Tariknan. After offering teacher’s training to the interested believers here, we plan to go together with them in June to Tariknan to teach there. This time, instead of just the missionaries teaching, it will be us together with Mibu men, team teaching and praying together for a harvest! 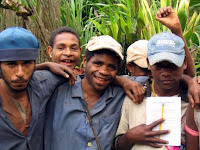 Please continue your prayers, the Mibu people are still very new believers. Incorrect teaching spreads as fast as gossip, and though everyone is still excited about their newly found salvation, life’s pitfalls and discouragements weigh on them and distract them from their love and gratitude to God – just as they can to any of us. Pray for us, for love and patience, for clarity in teaching, and that we remain focused on God ourselves.